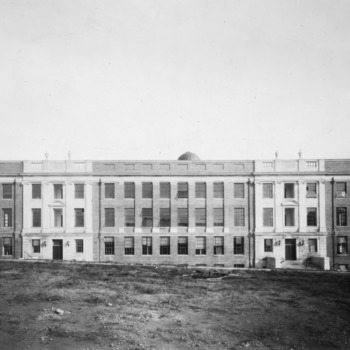 In July of 1886, there were elaborate ceremonies at the site, including speeches by prominent state officials, a procession of guests, and the laying of a cornerstone. 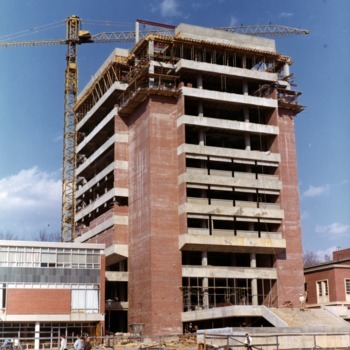 The cornerstone was laid for the first building on campus, originally called Main Building but later named Holladay Hall. 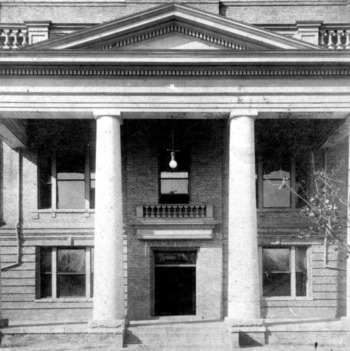 This building would later be renamed Holladay Hall, in recognition of the first President of the university, Alexander Holladay. 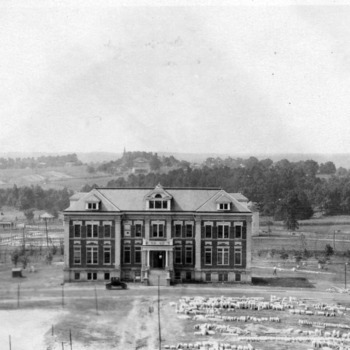 The building was constructed of 1.5 million "penitentiary bricks" made at the State Prison in Raleigh. 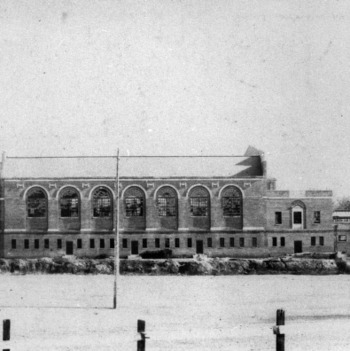 The Old Mechanical Building, designed by Professor J.H. 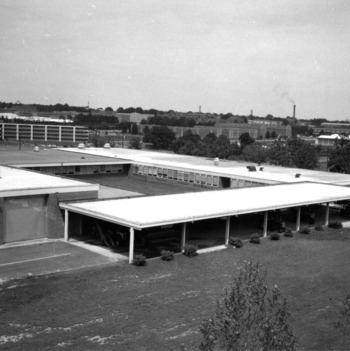 Kinealy, housed the entire department of Mechanical Engineering including the shops. 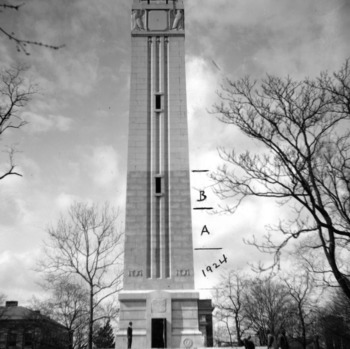 The first class of students planted the tree that became known at the Memorial Oak. 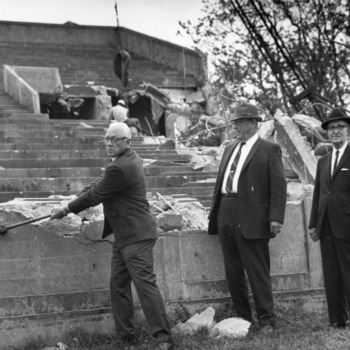 The tree lived until 1990, when it was removed because of a fungal disease. 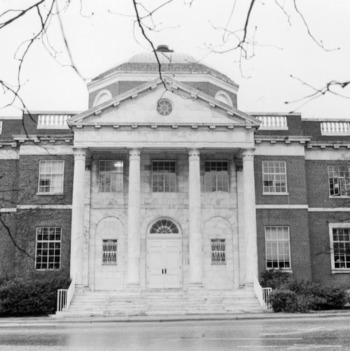 It is depicted in the chancellor's seal, and some of the wood was made into a table for the chancellor's office. 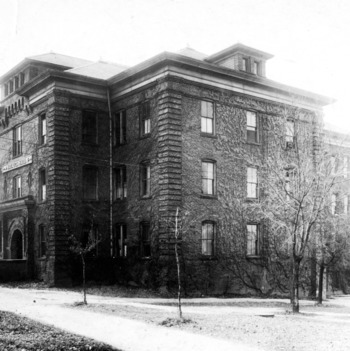 Watauga Hall, built by Charles W. Barrett, housed a dining hall, dorms, and kitchen. 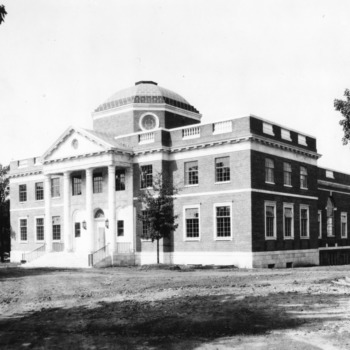 It was named for the Watauga Club, a club of young men who lobbied the State Legislature for the founding of State College. 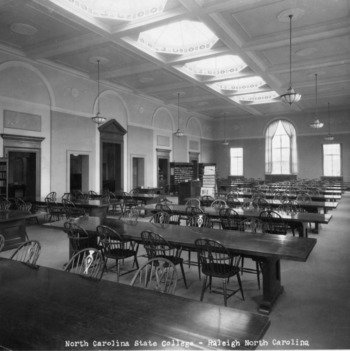 Pullen Hall was built by William P. Rose with space for a library, dining hall, assembly hall, and chapel. 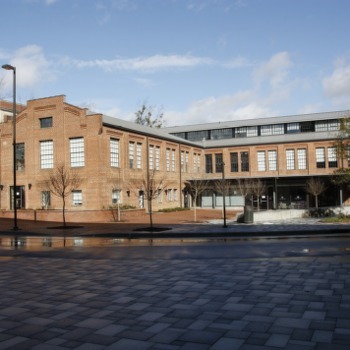 It was named for Richard Stanhope Pullen. 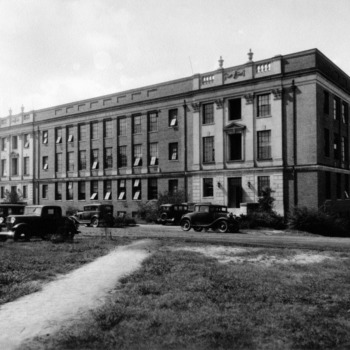 The Zoology Building was constructed for Animal Industry, Zoology, and Entomology and demolished in the mid 1950s. 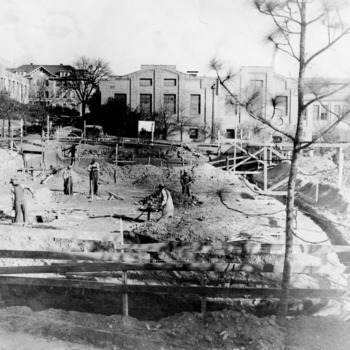 Construction began on the 1911 Building (originally the 1911 Dormitory) in 1909. 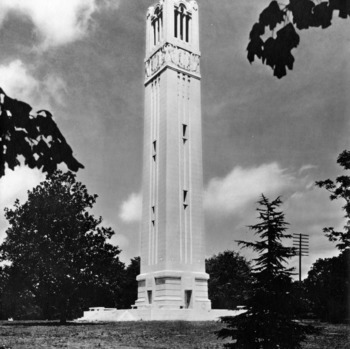 It was named for the class that banned freshman hazing. 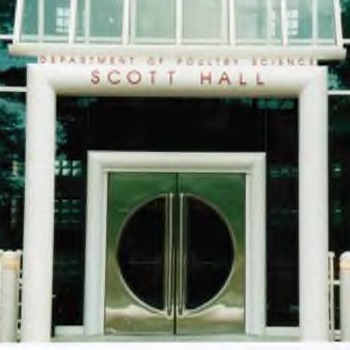 It has also housed the departments of Engineering Mechanics, Home Demonstration, Industrial Engineering, Rural Sociology, Veterans Administration, and Sociology and Anthropology. 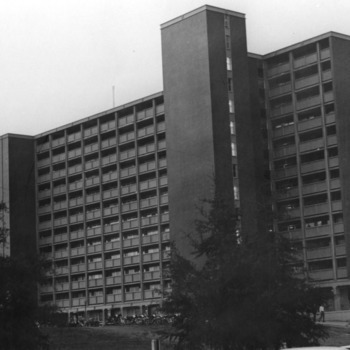 Leazar Hall, named for Augustus Leazar, was built as the dining hall, seating 750 students. 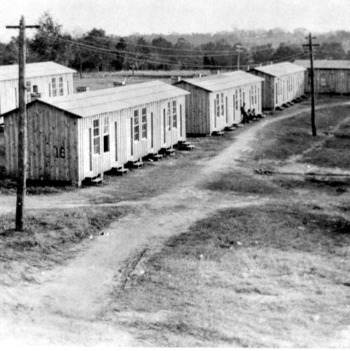 Due to increased student enrollment, ten temporary wooden buildings known as "The Shacks" were constructed. 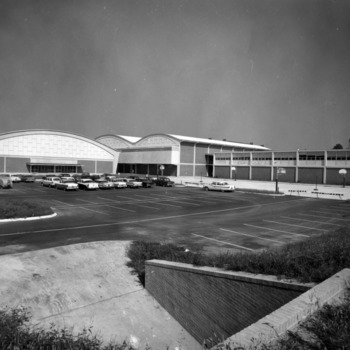 The Park Shops, built by Harry P.S. 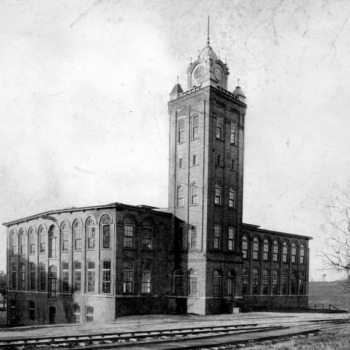 Keller, were originally built to house the mechanical shops, forge, and foundry. 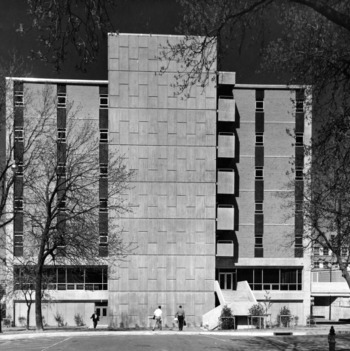 South Dorm (now the north wing of Syme Hall) opened. 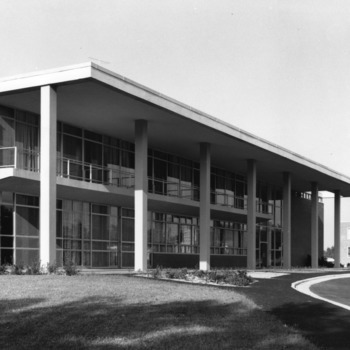 It was designed by architects Thomas W. Cooper and G. Murray Nelson. 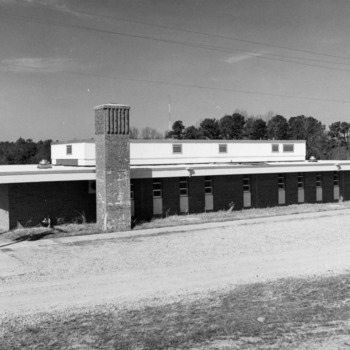 South Dorm, North Carolina College of Agriculture and Mechanic Arts. 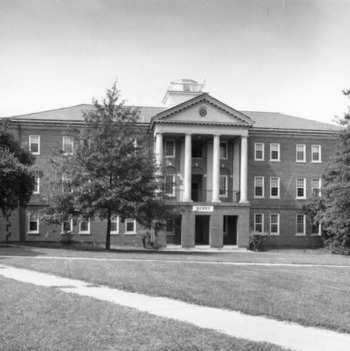 Welch Hall, a dormitory, was built by Hobart Brown Upjohn and named for alumnus Cleveland Welch. 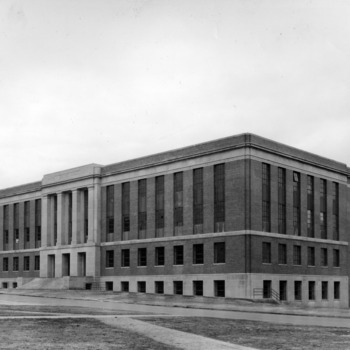 Gold Hall was built by architect Hobart Brown Upjohn and named after alumnus Charles Wyllis Gold. 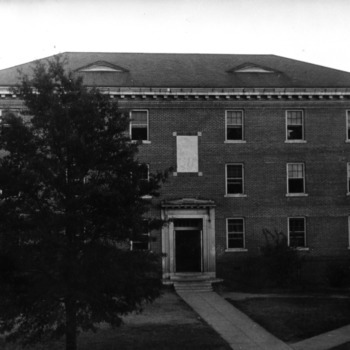 Page Hall was built by Hobart Brown Upjohn and named for Walter Hines Page, who was a member of the Watauga Club and instrumental in the founding of the college. 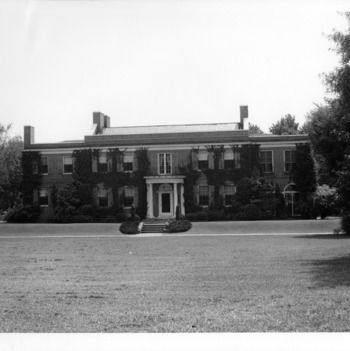 Chinqua-Penn Plantation, near Reidsville, North Carolina, was the home of Mr. and Mrs. Jefferson Penn. 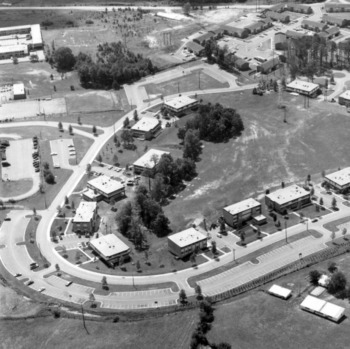 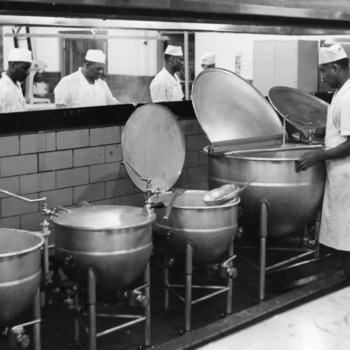 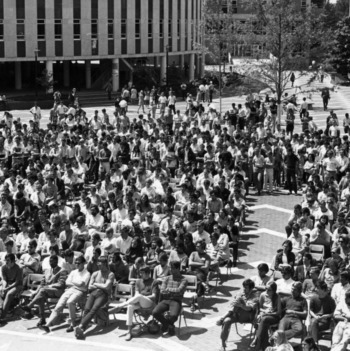 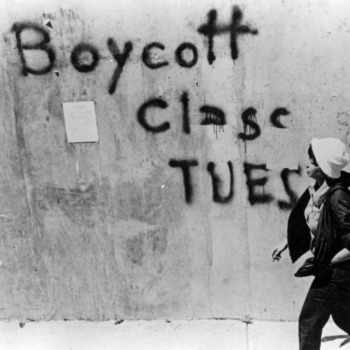 NC State University would help operate the plantation from 1959 to 2006. 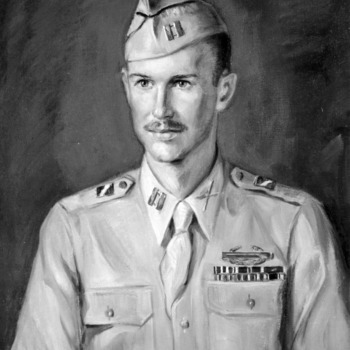 The new gymnasium on campus is named after Frank Thompson (Class of 1910), a former athlete at State College who was killed during service in WWI. 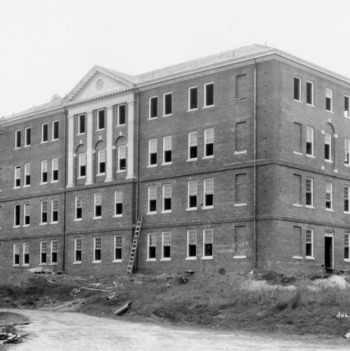 The south wing and center of Syme Hall were completed. 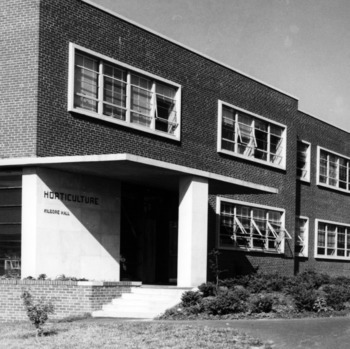 The architect was Hobart Upjohn. 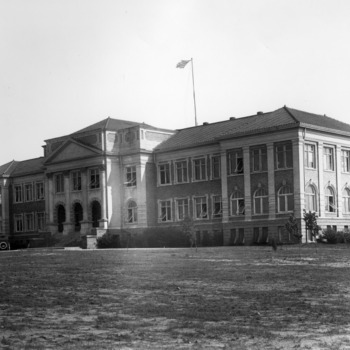 Syme Hall was later named for alumnus George F. Syme. 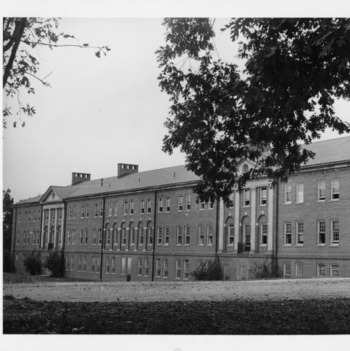 Bagwell Hall served as a dormitory and was built by Hobart Brown Upjohn. 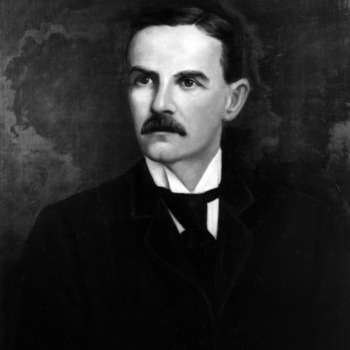 It was named for Eugene Cleveland Bagwell, an alumnus in civil engineering. 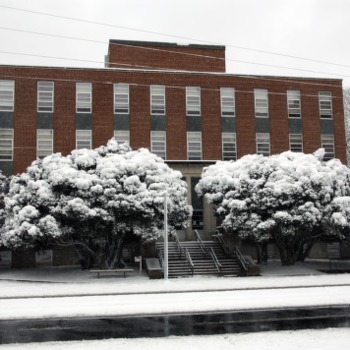 It was financed by the Public Works Administration. 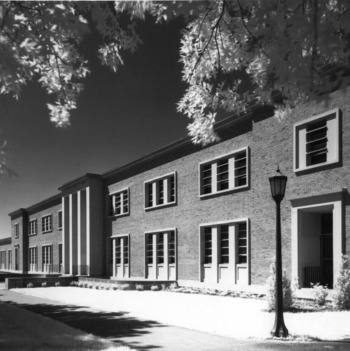 Daniels Hall was built by Hobart Brown Upjohn to house Electrical Engineering and Physics. 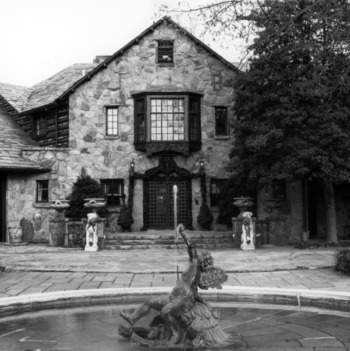 It was named for Josephus Daniels, a charter member of the Watauga Club. 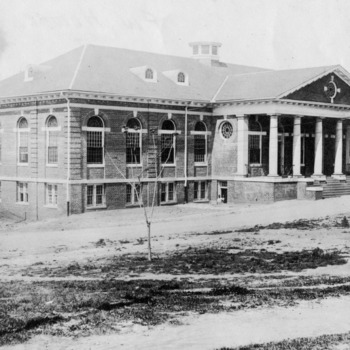 Polk Hall was built by Hobart Brown Upjohn and named for Leonidas LaFayette Polk. 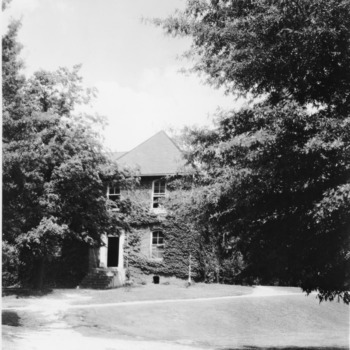 The Chancellor's Residence was built by Hobart Brown Upjohn and renovated in 2004. 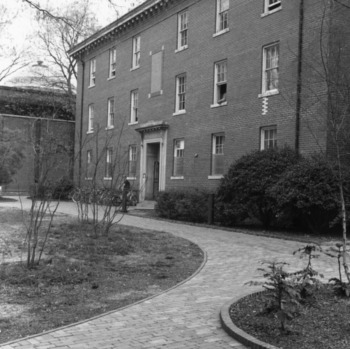 Chancellor's residence, North Carolina State College. 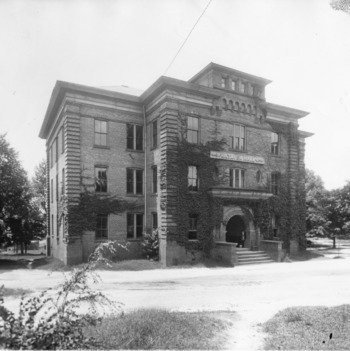 Peele Hall was built by Hobart Brown Upjohn and named for William Joseph Peele, founder of the Watauga Club. 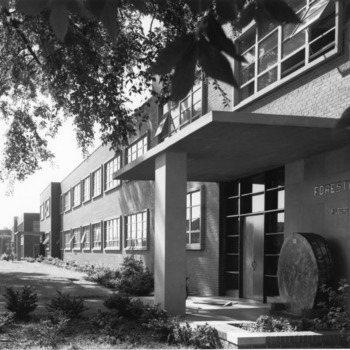 Hill Forest was donated by George Watts Hill. 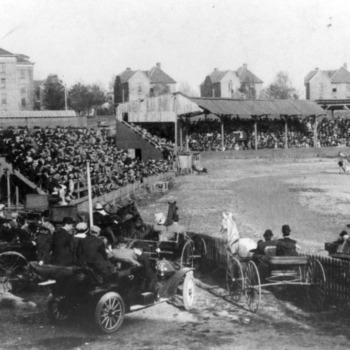 The grandstands were completed with loans from the Reconstruction Finance Corporation and a small grant from the Works Progress Administration. 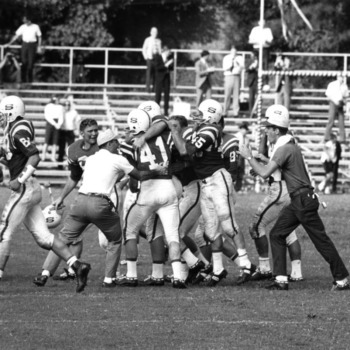 A new electric scoreboard and time clock are used at Riddick Stadium for the first time during a game against the University of Georgia. 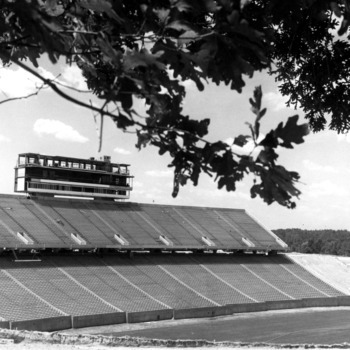 The scoreboard and clock were a donation from the News & Observer. 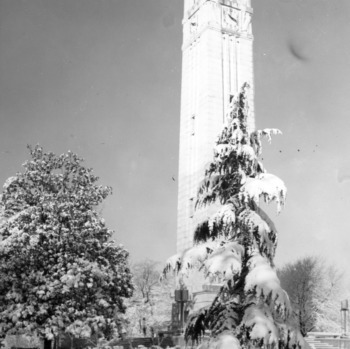 The DAR Monument was erected to honor the men and women who achieved the independence of the thirteen original colonies. 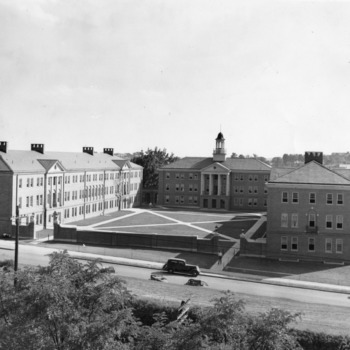 The Seventh, Eighth, and Ninth Dormitories formed the Freshman Quadrangle. 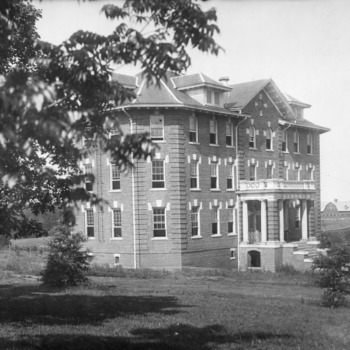 Becton Hall was built by Hobart Brown Upjohn and Ross Edward Shumaker and named for alumnus John Leland Becton. 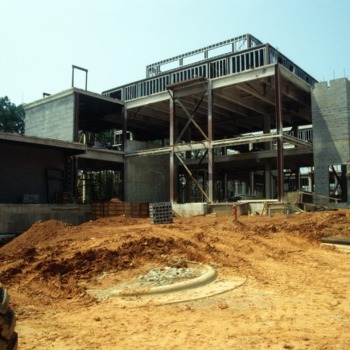 It was financed by the Public Works Administration. 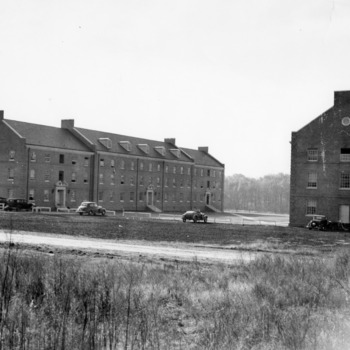 Berry Hall, a dormitory, was built by Hobart Brown Upjohn and Ross Edward Shumaker. 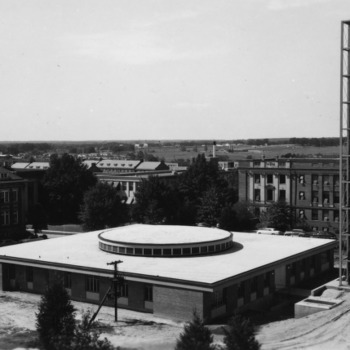 It was named for alumnus Leslie Graham Berry and was financed by the Public Works Administration. 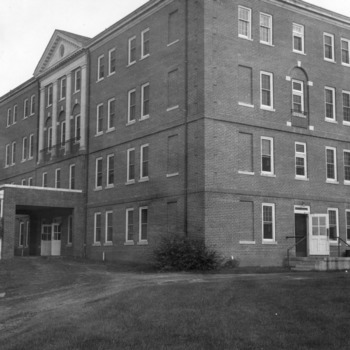 Clark Hall, originally a dormitory, became the center for Student Health Services. 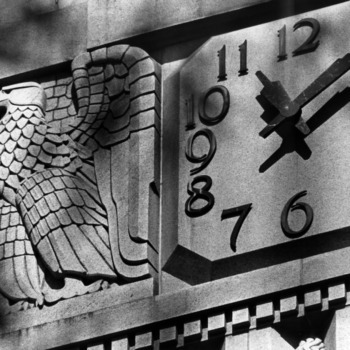 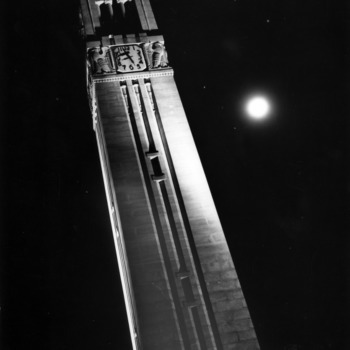 It was built by Ross Edward Shumaker and named for Walter Clark, Jr., who sent five sons to North Carolina State College. 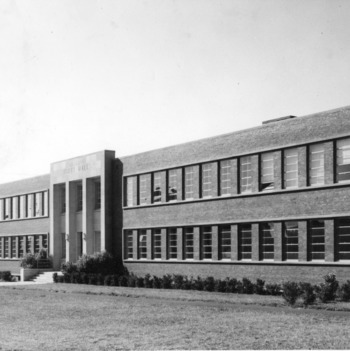 David Clark Laboratories was built by Ross Edward Shumaker. 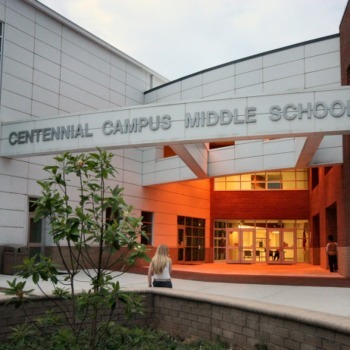 It was renovated in 2005. 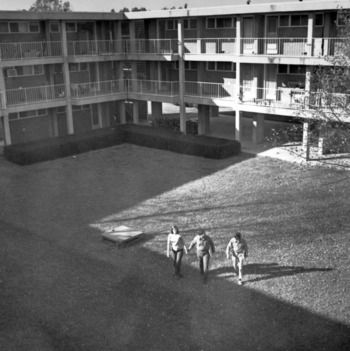 Turlington Hall was built as a dormitory by Ross Edward Shumaker with financial support from the Public Works Administration. 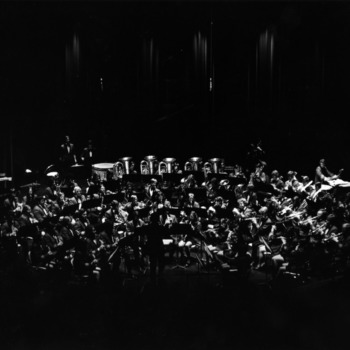 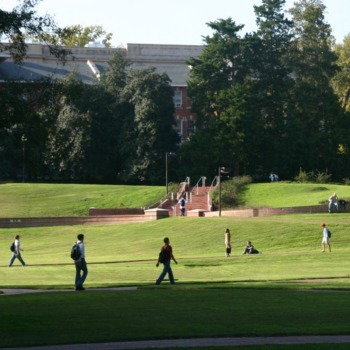 It was named for alumnus John Edwin Turlington. 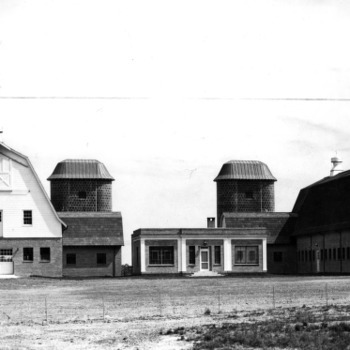 Located near the State Fairgrounds, the University Dairy Farm barns are now part of the College of Veterinary Medicine. 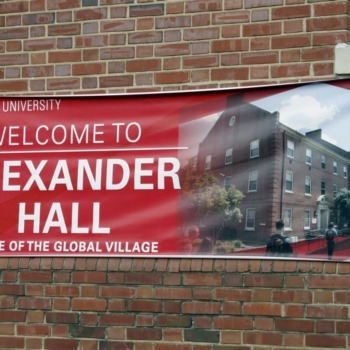 Alexander Hall (originally called "A Dormitory") was designed by Ross Edward Shumaker and named for alumnus Sydenham Bernard Alexander, Jr. Over time, it was a dormitory for men, women, International students, and finally a coed dorm. 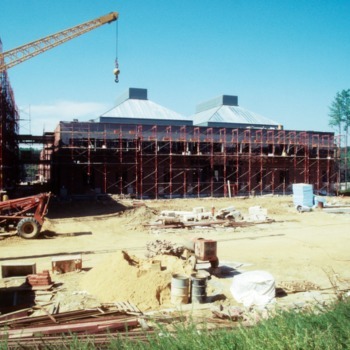 It was financed by the Public Works Administration. 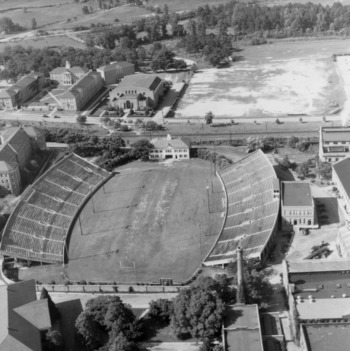 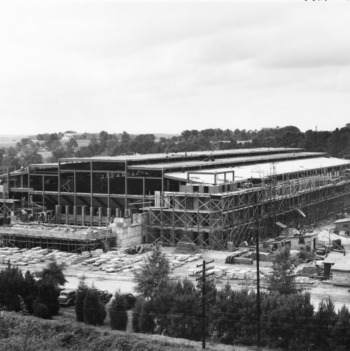 Reynolds Coliseum under construction, July 1, 1949. 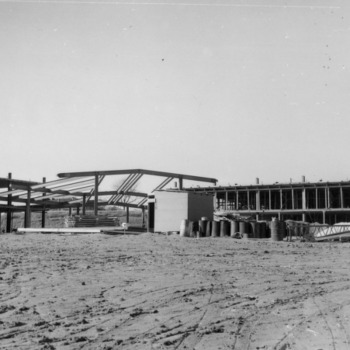 All dorms, the cafeteria, and other non-classroom buildings on campus are given official names for the first time. 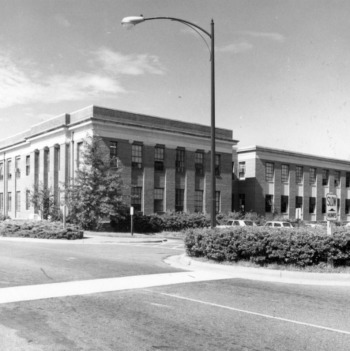 The Bureau of Mines Building was originally a research station for studying mineral industries. 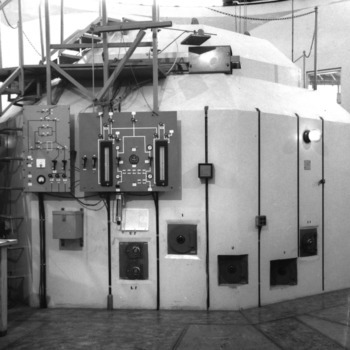 It was later the home of the first nuclear reactor on campus, before becoming the home of the Physics Department. 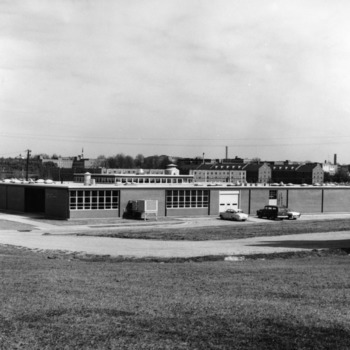 The Quonset Huts were built to help accommodate the influx of students entering after World War II on the GI Bill. 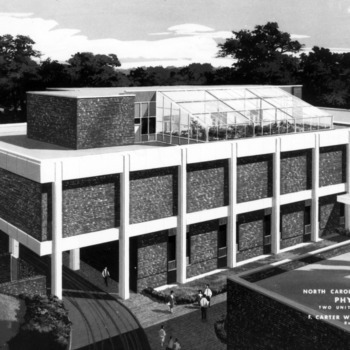 NC State borrows $500,000 to begin construction of two new dorms. 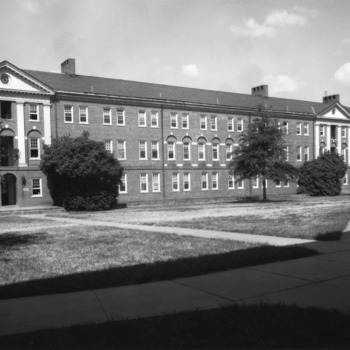 Owen Hall was built as a dormitory and named for Edwin Bentley Owen, an alumnus and professor of English. 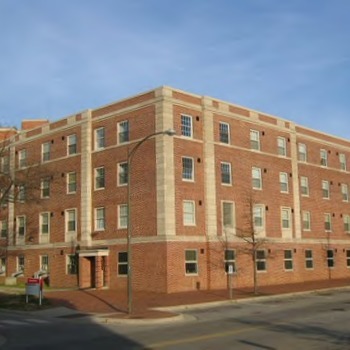 Built as a dormitory at the same time as Owen Hall, Tucker Hall was named for Irvin Burchard Tucker, who had been a member of the Board of Trustees and president of the General Alumni Association. 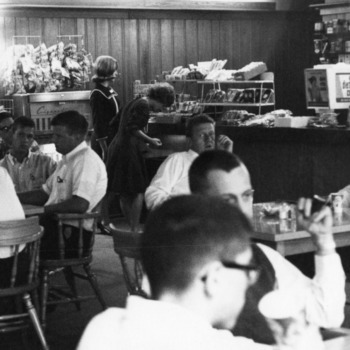 The Vetville Grocery Store was located in the basement of Vetville YMCA, offering a complete line of groceries at reasonable prices. 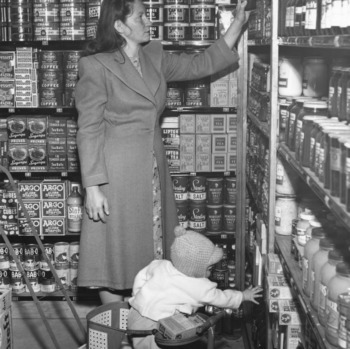 Woman and her child examining goods in the Vetville Mutual Grocery Co-op in the basement of Vetville YMCA. 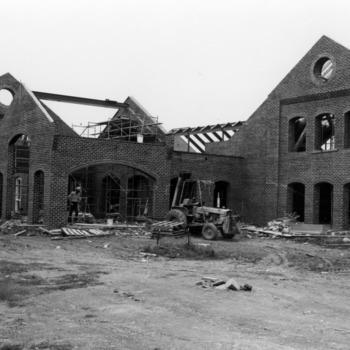 The existing Diesel Building became part of Broughton Hall. 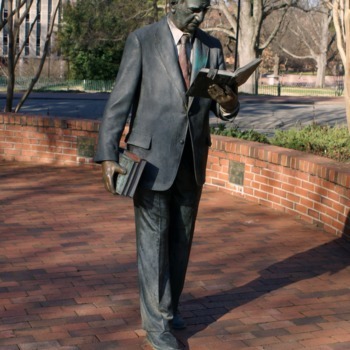 It was named for Joseph Melville Broughton, a former North Carolina governor and senator. 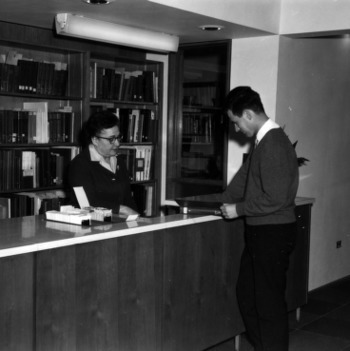 In 1974, the Print Shop becomes the New African American Cultural Center. 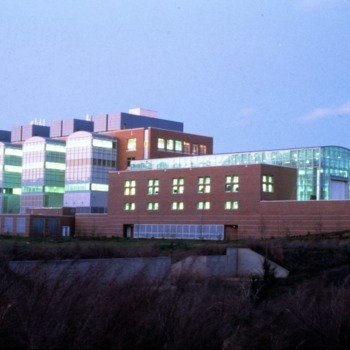 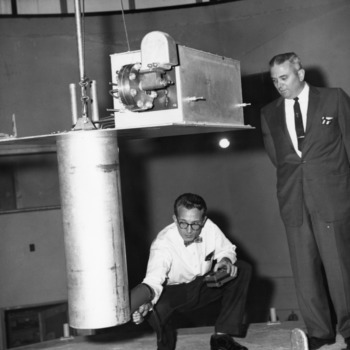 Burlington Engineering Labs was built as a center for NC State's research reactor. 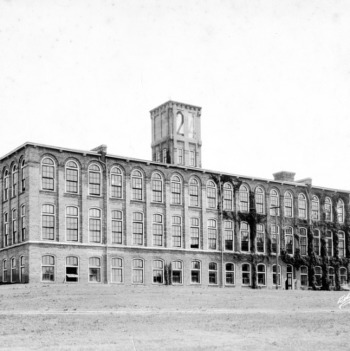 It is named for Burlington Industries, the North Carolina-based textile company. 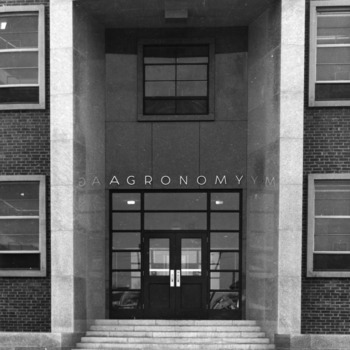 Williams Hall housed the Agronomy Department and was named for Charles Burgess Williams, an alumnus and charter member of the Agronomy Society of America. 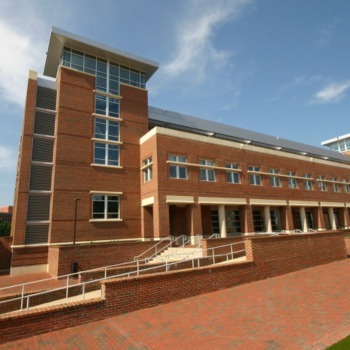 Gardner Hall was built to house the biological sciences and named for O. Max Gardner, State College alumnus and former North Carolina governor. 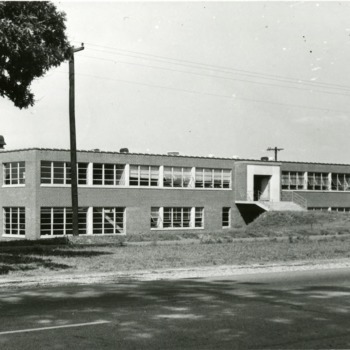 It was built by Biberstein, Bowles, & Meacham. 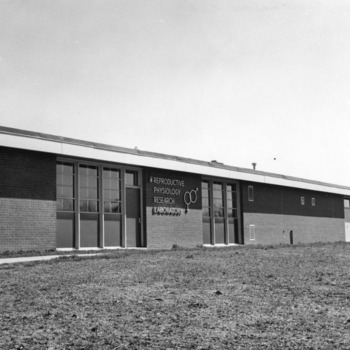 The Textiles Library is renamed the Burlington Textiles Library after Burlington Industries funds its expansion. 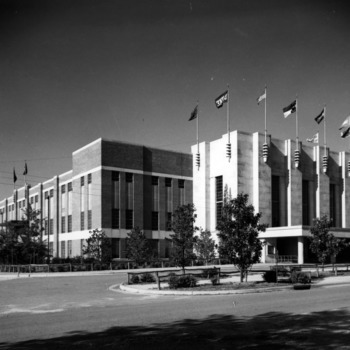 The studios (also known as "Television Center") housed TV studios, offices, and other facilities for producing and transmitting programs. 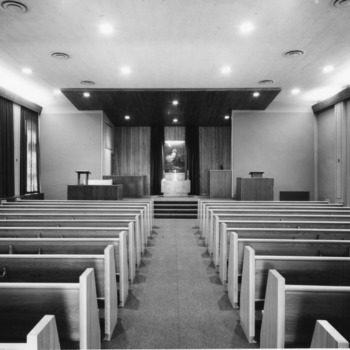 Danforth Chapel was named for philanthropist W.H. 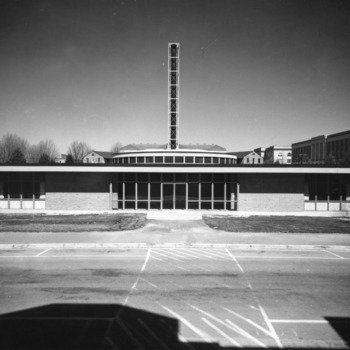 Danforth and was inside the YMCA Building (King Religious Center). 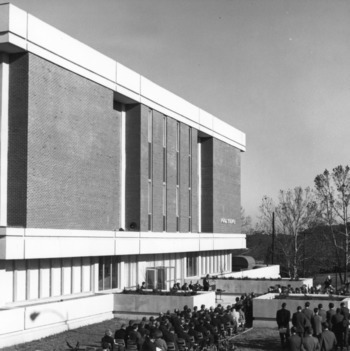 Built as the original D.H. Hill Library, Brooks Hall was renamed and dedicated on April 12, 1956. 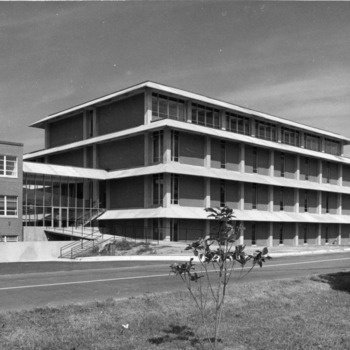 It was remodeled to be the School of Design, with an addition to the North Side. 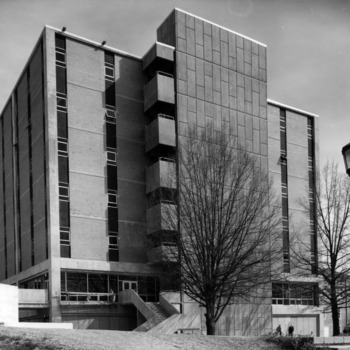 Brooks Hall was named for Eugene Clyde Brooks, a former president of State College. 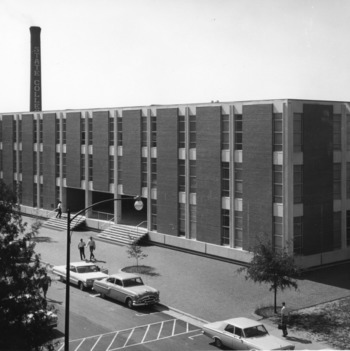 The building that housed the Division of Maintenance and Operations was formally named the Morris Building after William Flaude Morris, the director of many years of the Service Department at North Carolina State College. 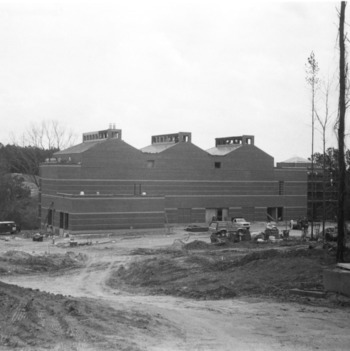 The Robertson Pulp and Paper Laboratory was named for Reuben B. Robertson, a pulp and paper industrialist and advocate of forest conservation. 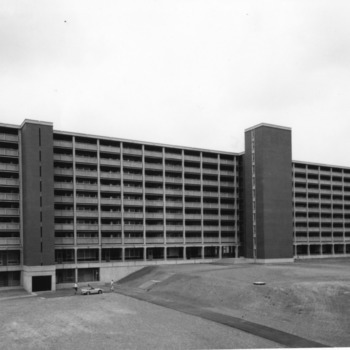 The architect was G. Milton Small. 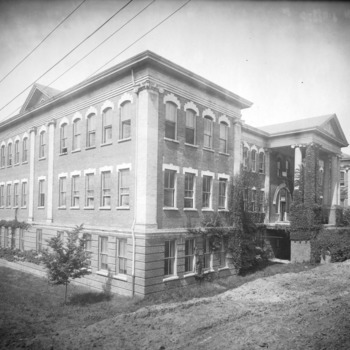 Previously the Student Supply Store or book store was housed in Primrose Hall, Leazar Hall, the King Religious Center, and Watauga Hall. 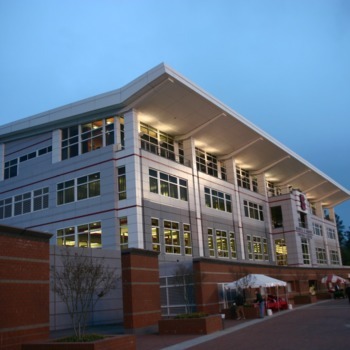 Student Supply Store, North Carolina State University. 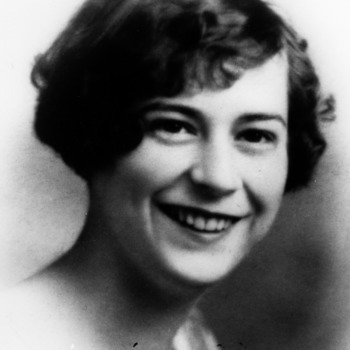 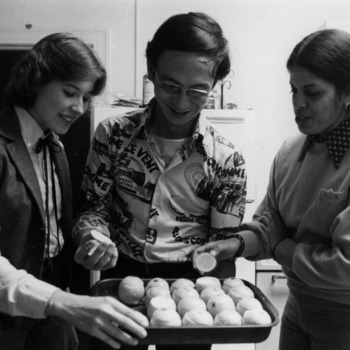 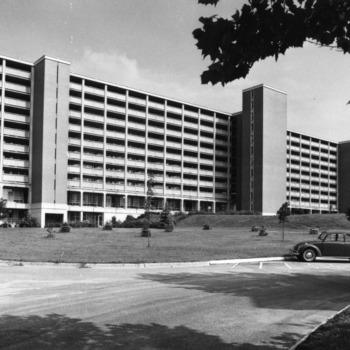 McKimmon Village opened as housing for married students.It was named for Jane McKimmon, an alumnus and founding member of the National Home Economics Association. 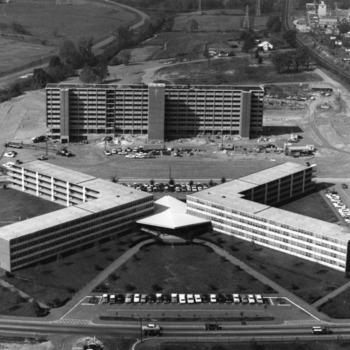 It was renamed E.S. 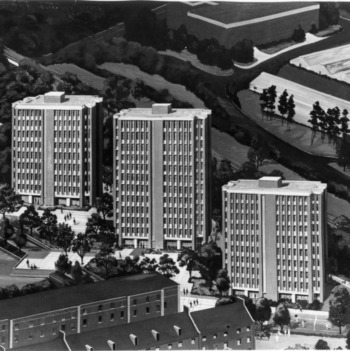 King Village in 1976. 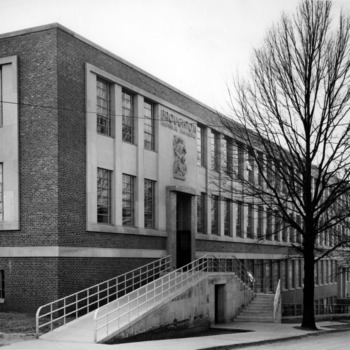 The Hodges Wood Products Laboratory was named for Brandon Patton Hodges, a former state senator, state treasurer, and advisor to the Champion Paper and Fiber Company, based in Canton, NC. 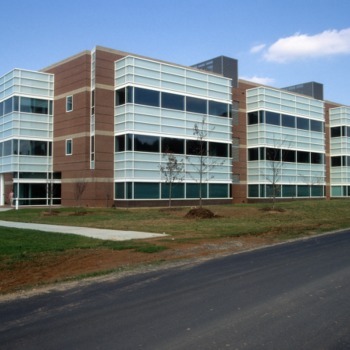 The Reproductive Physiology Research Laboratory was founded to study reasons for the low reproductive rate in farm livestock. 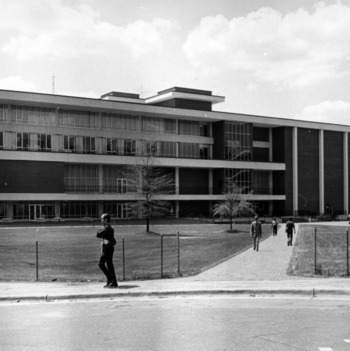 Harrelson Hall was designed by Holloway and Reeves with Edward Waugh. 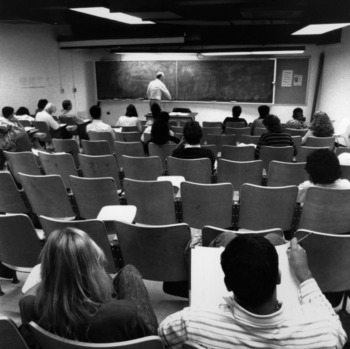 It was the first round classroom built on a university campus. 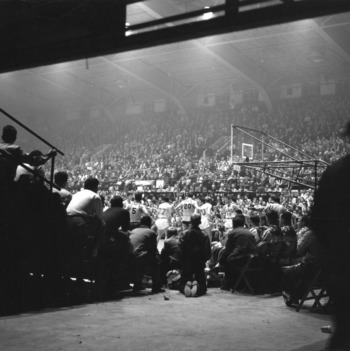 Carmichael Gymnasium was named for William Donald Carmichael, a World War I Veteran and advocate for the completion of Reynolds Colisseum. 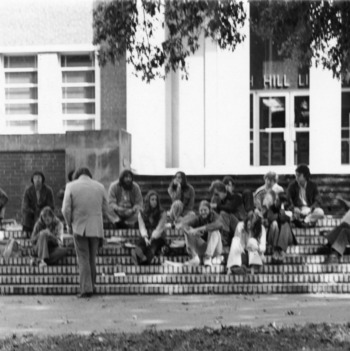 Harris Hall was originally built as a cafeteria but later housed the departments of Counseling, Registration and Records, Student Development and Residence Facilities. 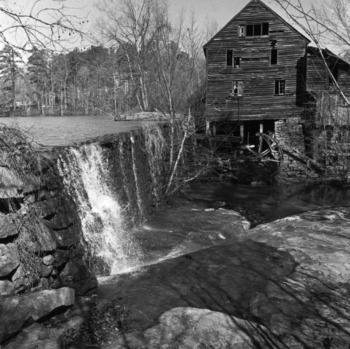 It was named for NC State's first cafeteria manager, Louis Hines Harris, who was hired to feed students using a limited budget following World War I.
Yates Mill, off Lake Wheeler Road near campus, was to be used as a research mill but fell into disrepair. 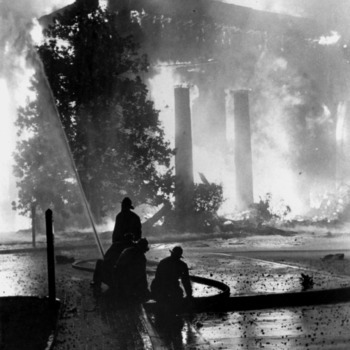 Fraternity Row was later renamed Greek Court. 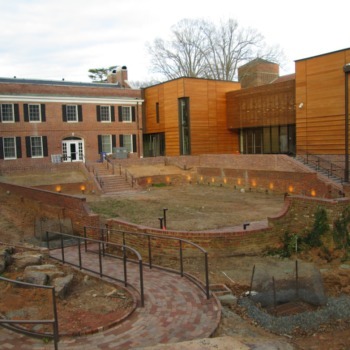 Greek Court was renovated to become Greek Village. 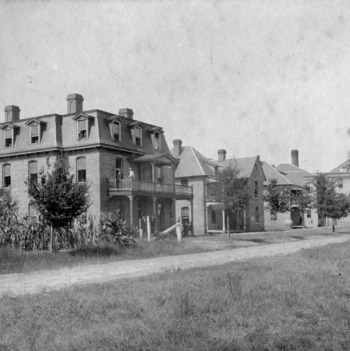 The Chinqua-Penn Plantation was affiliated with NC State University until 2006, when it was purchased by a private citizen. 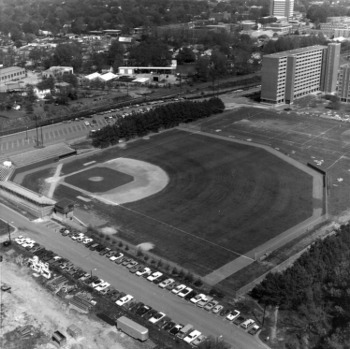 It was the site of the Betsy-Jeff Penn 4-H Center. 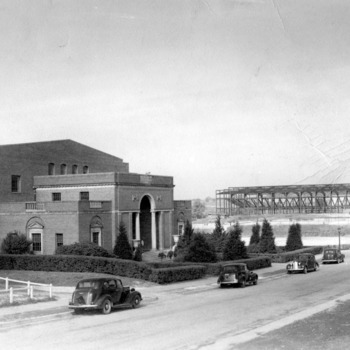 Thompson Theater was named for alumnus Frank Martin Thompson. 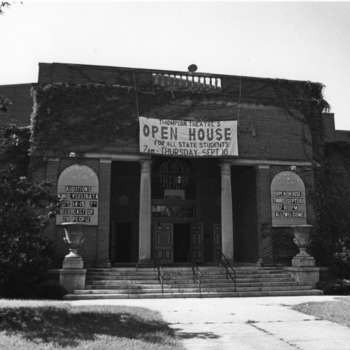 Front view of Thompson Theater, North Carolina State University, showing "Open House" banner hanging above entrance. 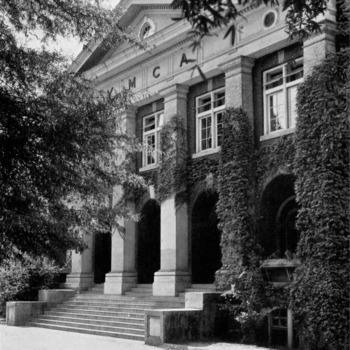 Mann Hall was named for Carroll Lamb Mann, an alumnus and head of the Department of Civil Engineering from 1916 until his retirement in 1948. 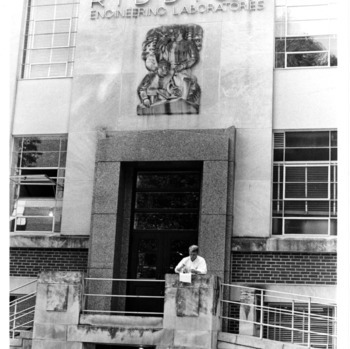 The General Labs building originally housed the administrative offices for the School of Physical and Mathematical Sciences, as well as the departments of Physics and Statistics. 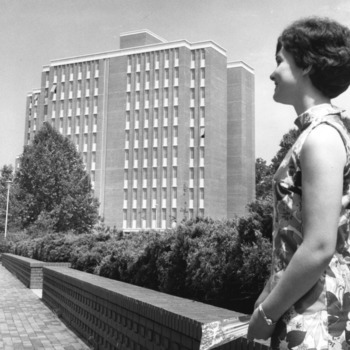 In 1970, it was renamed Cox Hall in honor of Gertrude Mary Cox, professor emeritus of experimental statistics. 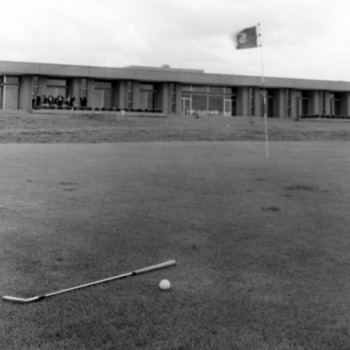 The Faculty Club, built by Guy Crampton, contained a dining hall, tennis courts, a swimming pool and a golf course. 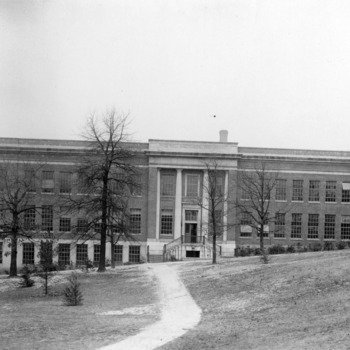 It was established through the efforts of Richard Reynolds, an alumnus and tobacco company heir. 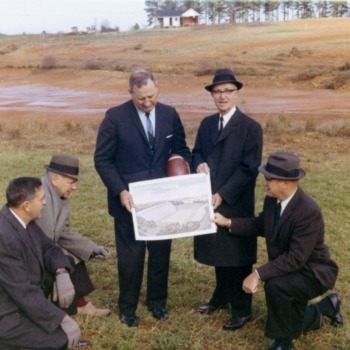 A groundbreaking ceremony takes place for the construction of Carter Stadium (later Carter-Finley). 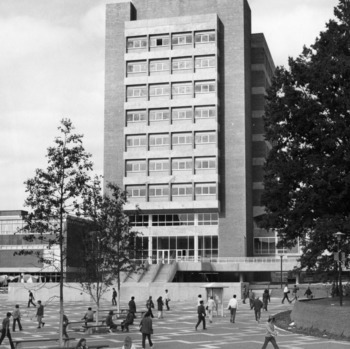 It was named for Nick and Harry Carter. 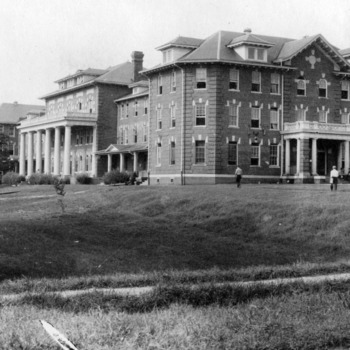 Carroll Hall was named for Susan Catherine Colwell Carroll, a nurse who became the resident matron of the college infirmary. 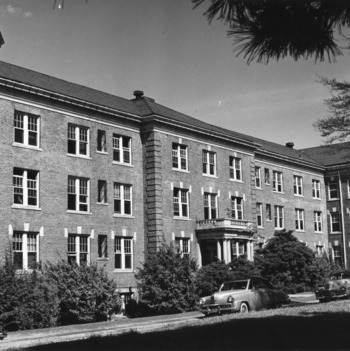 Sullivan Hall was originally built as a dorm and is named for William Henry Sullivan, a former president of the Alumni Association and board member on the UNC Board of Trustees. 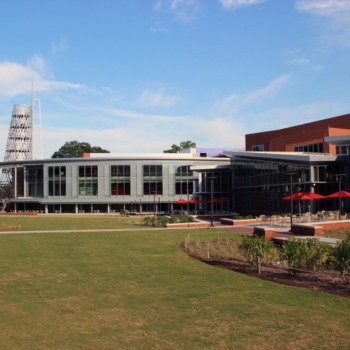 Doak Field opens as the new facility for the baseball team. 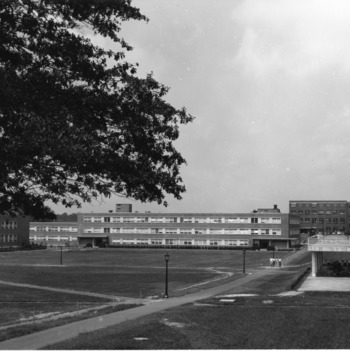 The Dearstyne Avian Health Center was named for Roy Styring Dearstyne, who served as professor of poultry science and pathologist for the Agricultural Experiment Station starting in 1922. 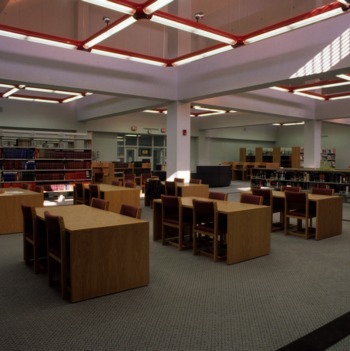 The School of Design Library was named in honor of Mrs. Lyons, librarian at the school for 20 years. 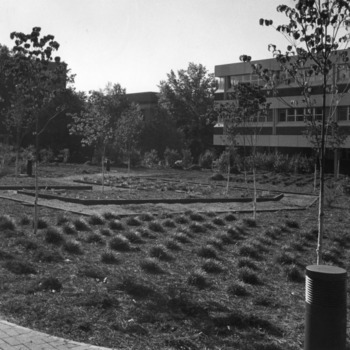 University Plaza (called "The Brickyard") was designed by Richard C. Bell, landscape architect. 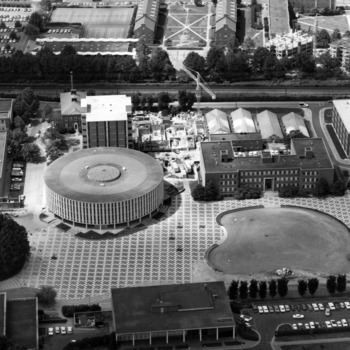 It was conceived as a public gathering place in the European tradition and has often been described as reminiscent of Saint Mark's Square in Venice. 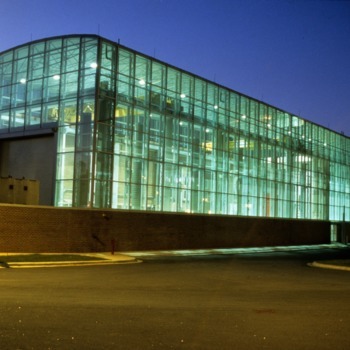 The Phytotron was created to research the influence of environment on primary growth processes in plants. 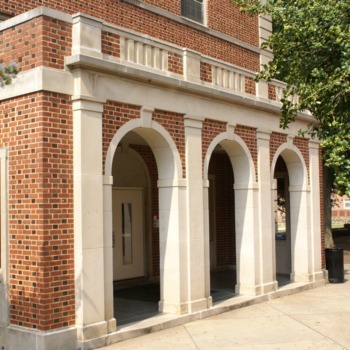 Dabney Hall was built to house the Department of Chemistry and was named for Charles William Dabney, a charter member of the Watauga Club and a professor of Chemistry. 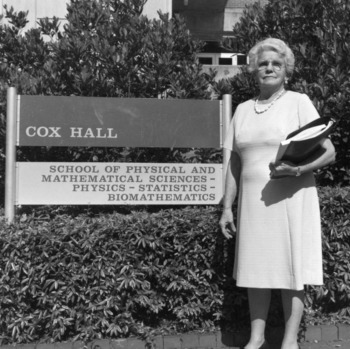 Cox Hall was built to house Physics and Statistics and was named for Gertrude Mary Cox, the first female full professor at NC State. 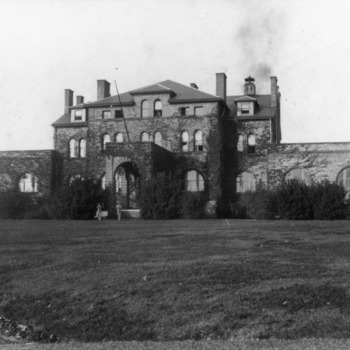 Biltmore Hall was built to house Teaching and Research and was named after the Biltmore Forest School, a forestry school near Biltmore Estate that was established by Dr. Carl Alvin Schenck. 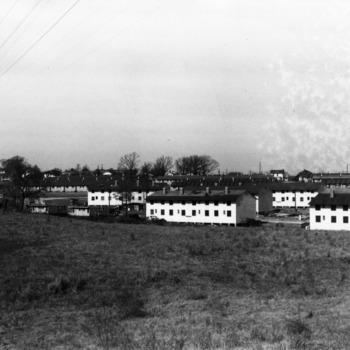 Randleigh Farm was devoted to the research of improving methods of dairy farming. 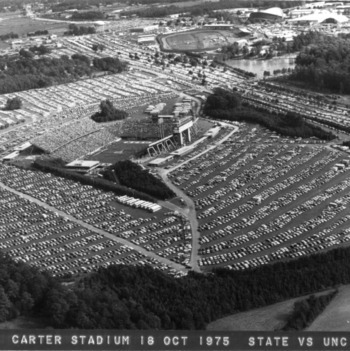 It was the bequest of William R. Kenan, Jr. and was sold to Wake County in 2005. 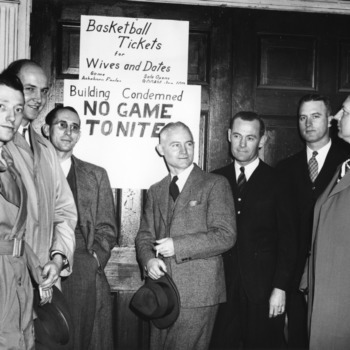 The Case Athletics Center opens, named after Everett N. Case, Men's Basketball coach from 1946 to 1965. 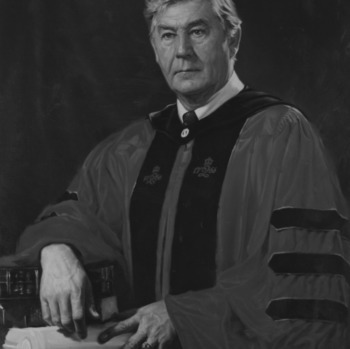 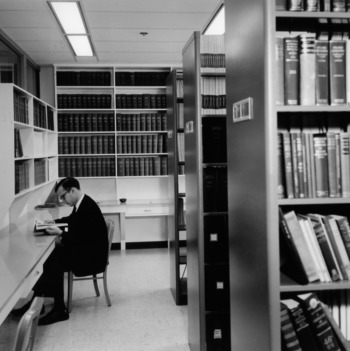 The Swann Memorial Library of Chemistry was named for Dr. Ralph C. Swann, former head of chemistry, and was located in Dabney Hall. 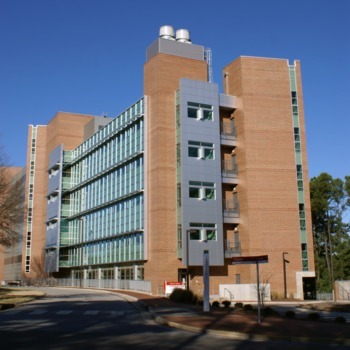 The Grinnells Animal Health Laboratory was named for Claude Delbert Grinnells, professor of Animal Husbandry at NC State for 33 years. 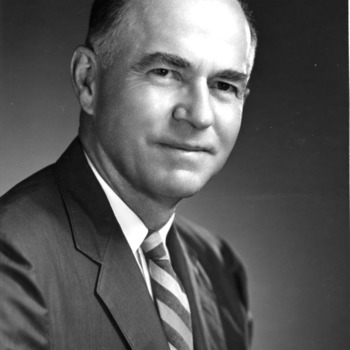 He was named North Carolina Veterinarian of the Year in 1958. 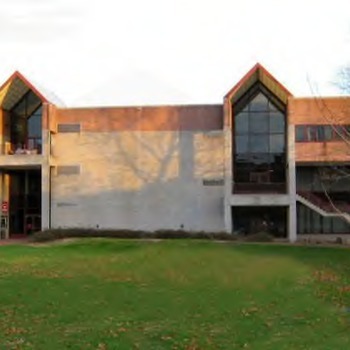 The Gardner Arboretum is located on a one-acre tract between Patterson Hall and Burlington Laboratories. 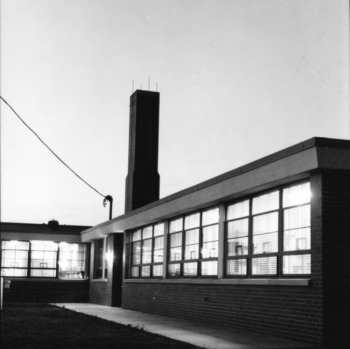 It was named for M.E. 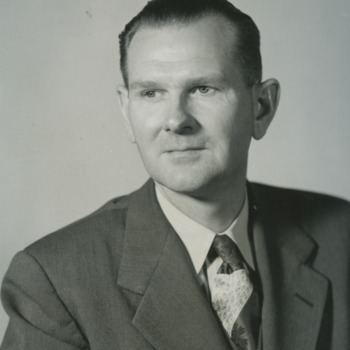 Gardner, former head of the Department of Horticulture. 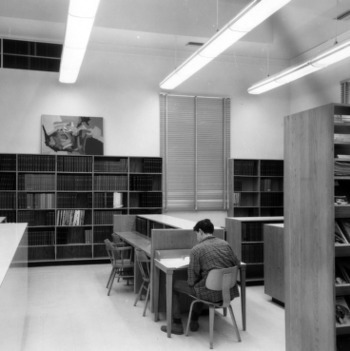 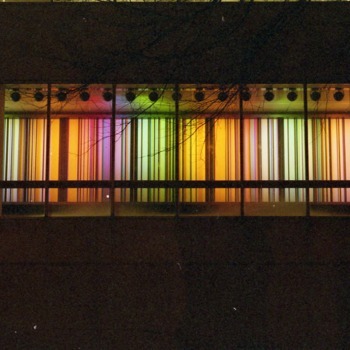 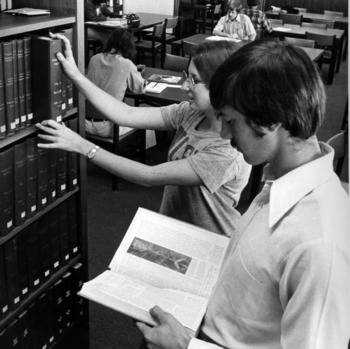 The old Erdahl-Cloyd Student Union was remodeled to include a book reserve room, an undergraduate browsing collection, and an audiovisual room. 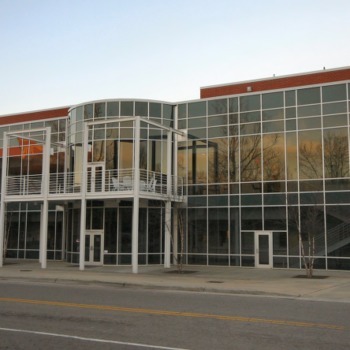 The new Print Shop on Sullivan Drive replaces the old one on West Dunn and Dan Allen. 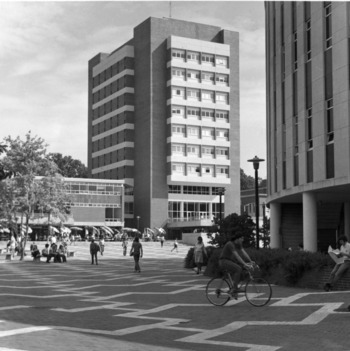 It houses University Graphics. 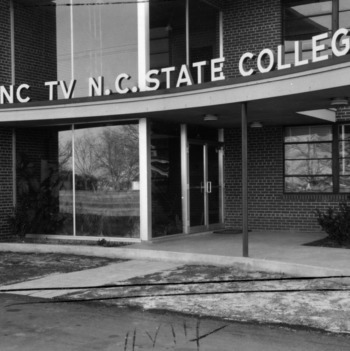 The College Inn, formerly a motel, was purchased by the Wolfpack Club and converted into a residence hall. 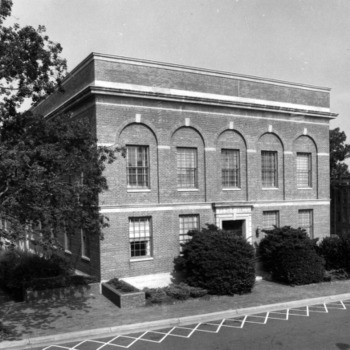 The Hillsborough Building, on the corner of Hillsborough and Fairmount streets, was purchased to house the computing center and offices for the Department of Economics. 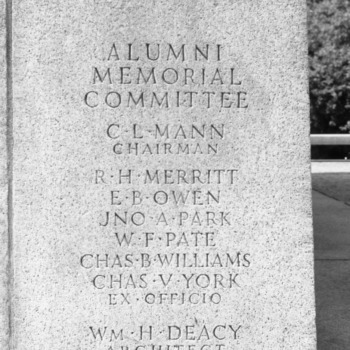 Married students housing, previously called McKimmon Village, was renamed for Edward S. King, the general secretary of the YMCA on campus from 1919 to 1955. 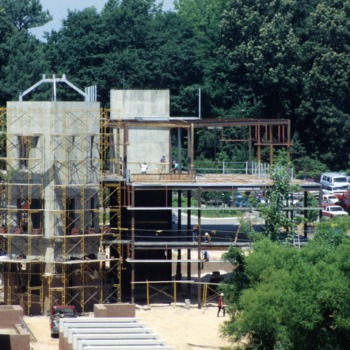 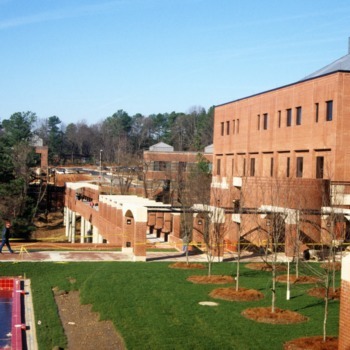 The University Student Center Plaza, in front of the old University Student Center (now Talley), was designed by landscape architect Richard Bell. 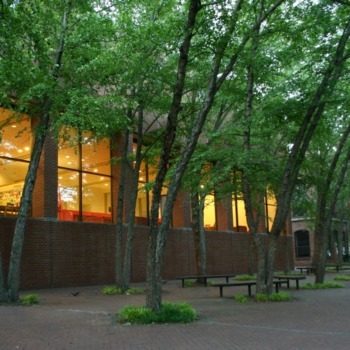 The Gardner Hall Addition was built by Carter Williams Architects. 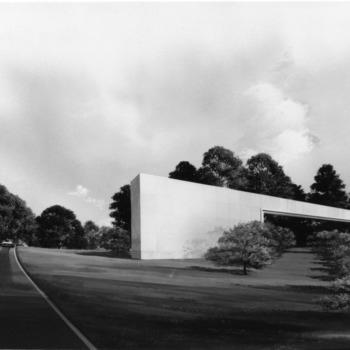 The new Pullen Bridge replaces the old one, which had stood for 50 years. 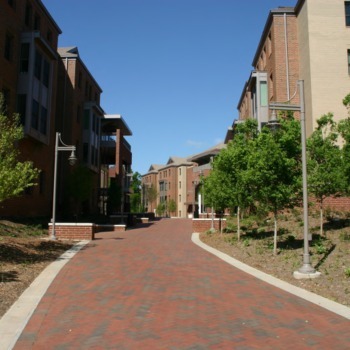 It spans the railroad tracks that run through campus. 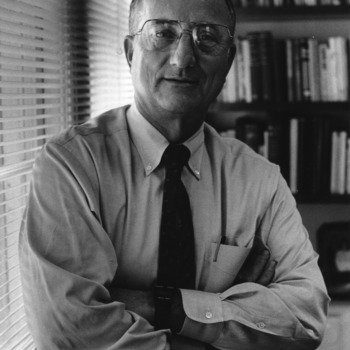 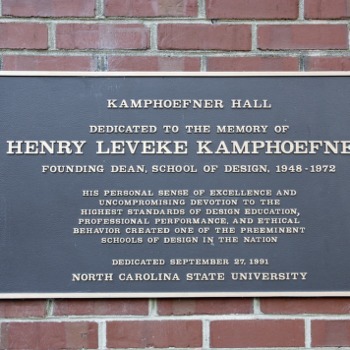 Kamphoefner Hall was named for Henry L. Kamphoefner, founding dean of the College of Design. 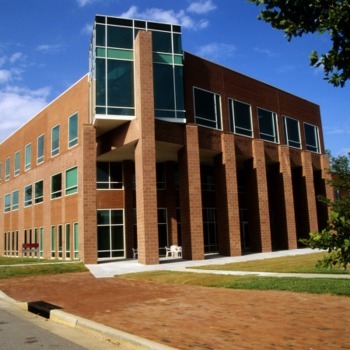 It was built by Charlotte-based Wolf Associates to provide studio, teaching, and office space. 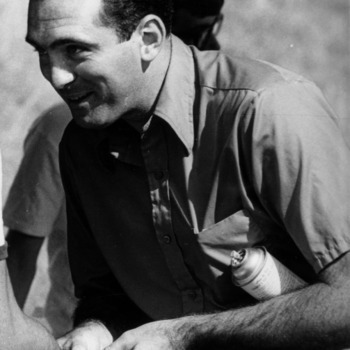 The University Track is renamed the Paul H. Derr Track, for the long-time track and field coach. 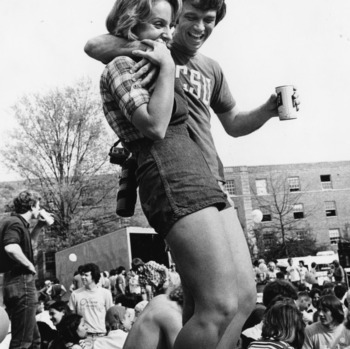 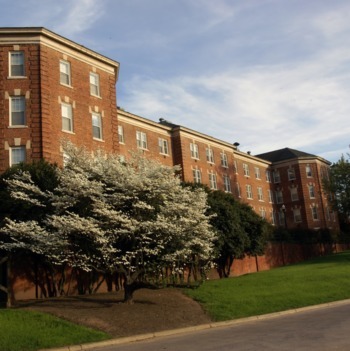 North Hall (formerly the Lemon Tree Inn) was acquired by N.C. State and used as a dormitory. 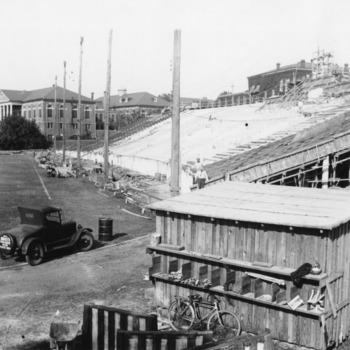 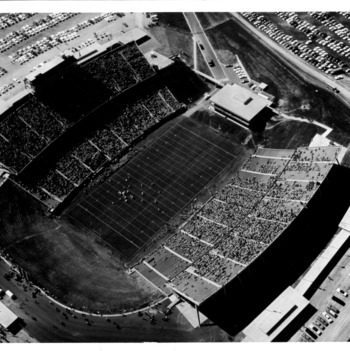 The stadium was renamed in honor of Wilbert James "Nick" Carter, Harry Clifton Carter, and Albert Earle Finley. 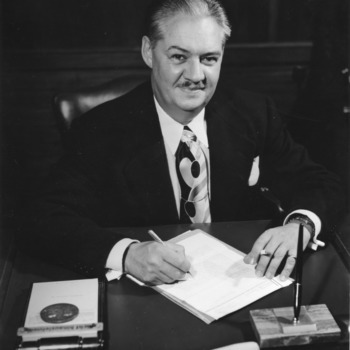 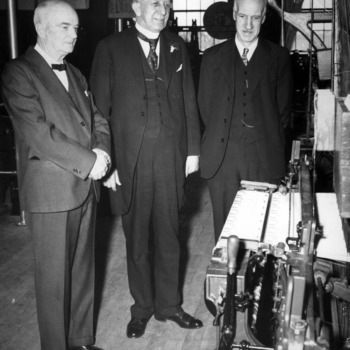 Both Carters were top executives at J.P. Stevens and Finley was a successful businessman and philanthropist. 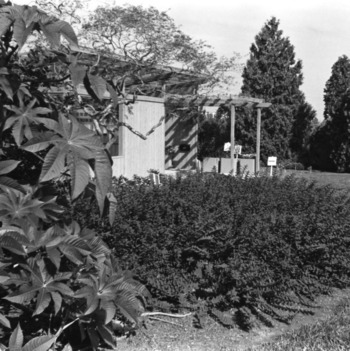 The Arboretum, located on Beryl Road, was later renamed for Dr. J.C. Raulston, its founder and director. 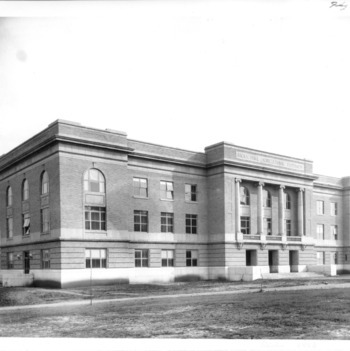 Bostian Hall, named for Chancellor Carey Hoyt Bostian, was built as an addition to Gardner Hall to house the biological sciences. 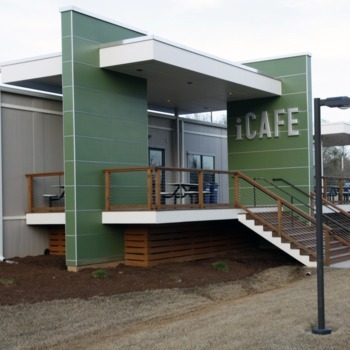 The Solar House showcases the solar and solar-efficient technologies of the NC Solar Center. 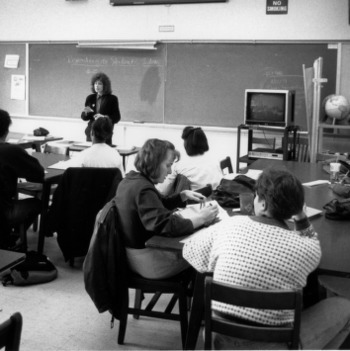 It is intended for public education as well as scholarly research. 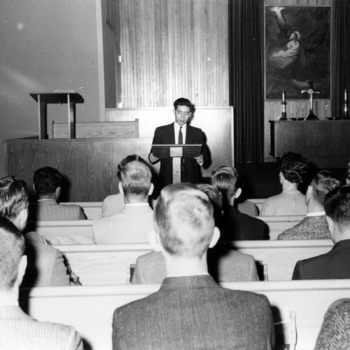 Wells Auditorium, inside Bostian Hall, was named for Bertram W. Wells, former head of the Botany Department. 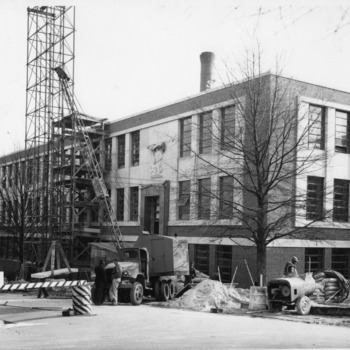 The original four murals, by artist James A. McLean for the Works Progress Administration, hung in Brooks Hall and were removed due to public outcry. 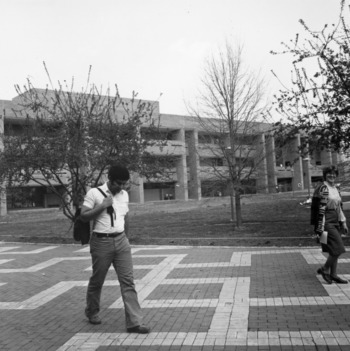 Three were destroyed but one was rediscovered and formally installed in the Student Center in 1982. 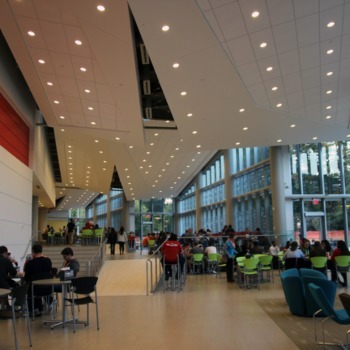 This addition added 130,000 square feet with amenities such as an Olympic-size swimming pool, an indoor jogging track, and a dance studio. 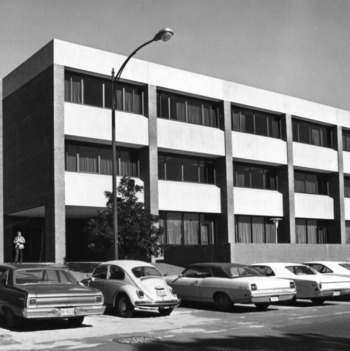 The Administrative Services Building (now Administrative Services II) was built for the Finance and Business Division. 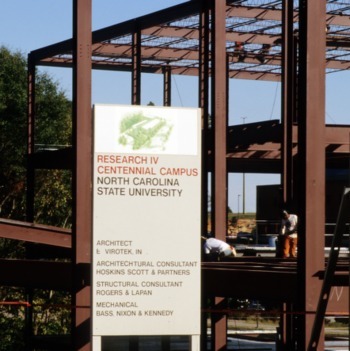 When Raymond P. Cunningham left his Kinston estate to NCSU, it became the Cunningham Center, now the Cunningham Research Station. 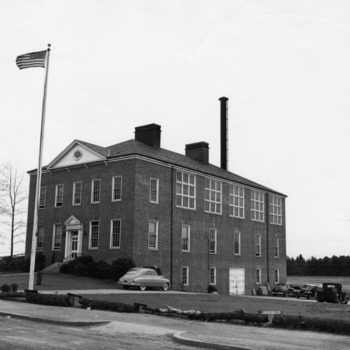 In 1989, it was combined with the Lower Coastal Plain Tobacco Research Station. 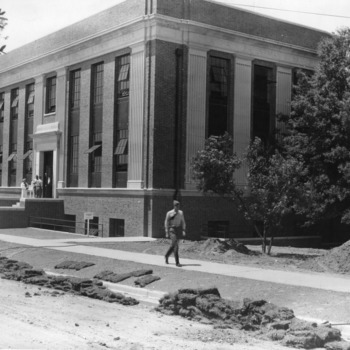 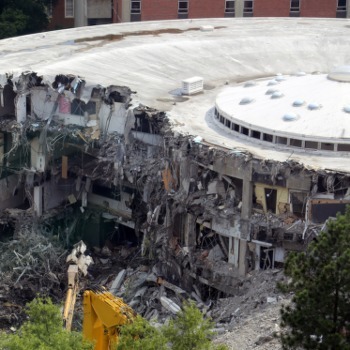 Construction begins on the Natural Resources Research Center, later renamed Jordan Hall in honor of R.B. 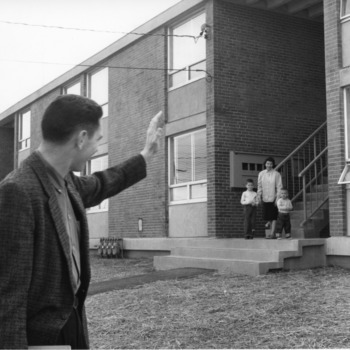 Jordan, Jr., and his children. 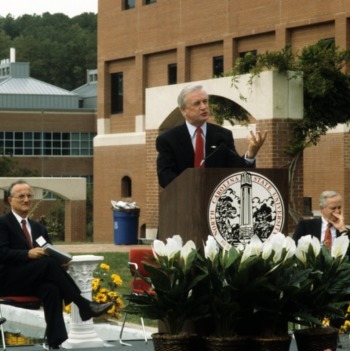 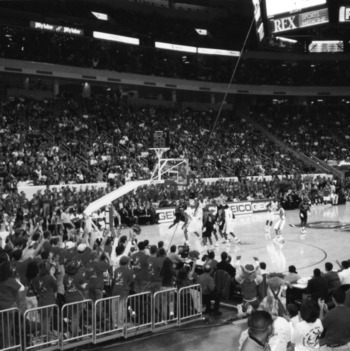 The Jordan family has a history of strong support for NC State University. 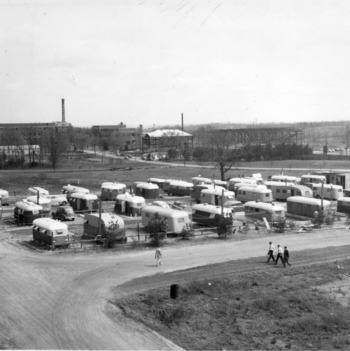 The Court of North Carolina was previously used as a cow pasture and later as the site of the Quonset Huts that served as housing for World War II veterans. 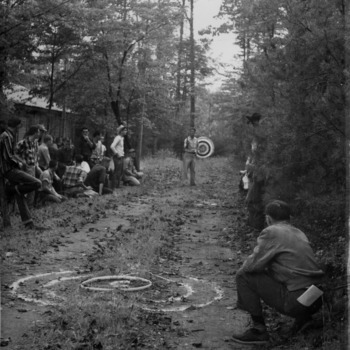 Legend has it that planted within the Court were trees to represent each of North Carolina's 100 counties, but there is no evidence that was ever the case. 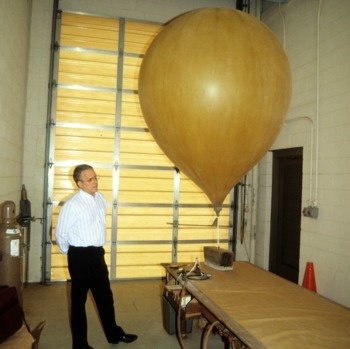 The Listening Vessels, sitting 90 feet apart, amplify sound such that people can talk into them at normal volumes and hear each other. 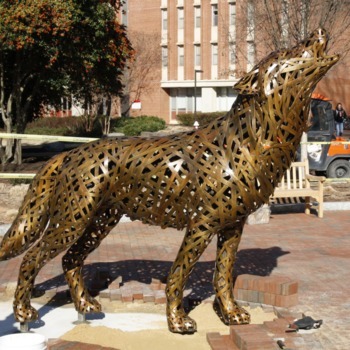 It was created by sculptor Doug Hollis in honor of the University's participation in the 1987 Olympic Festival. 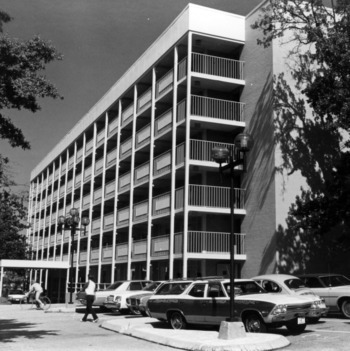 The building that later was named Research I was first occupied. 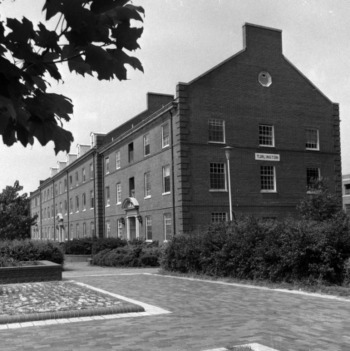 Pullen Hall was named for Richard Stanhope Pullen, who gave the original 62 acres of land to the University (then, college). 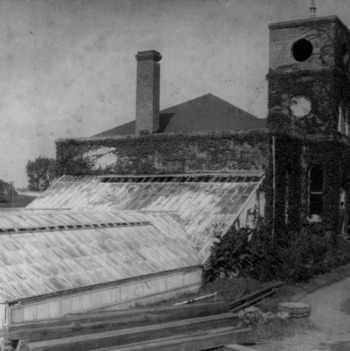 Old Pullen Hall burned down in 1965. 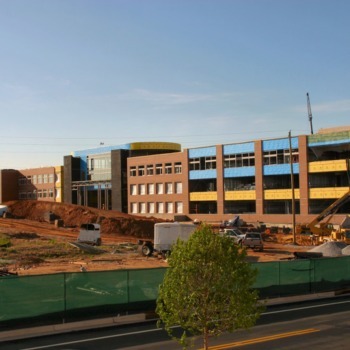 Asea Brown Boveri (ABB) moves into Centennial Campus, becoming the first corporate tenant there. 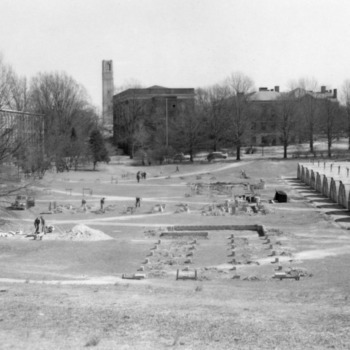 The installation of a new irrigation system in the lawn next to the Student Center Annex (now called Witherspoon Student Center) results in a cut gas line, forcing the evacuation of Harris Hall, Pullen Hall, and the Student Center Annex. 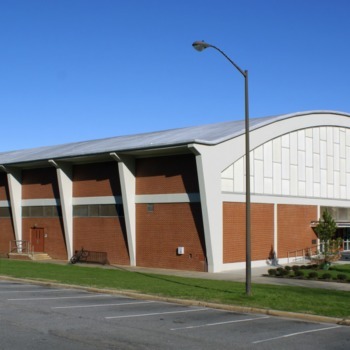 The Casey Aquatic Center (also called the Carmichael Natatorium) was added onto Carmichael Gymnasium. 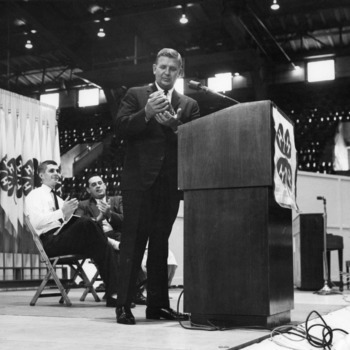 Willis Casey was head swimming coach and later Athletics Director, from 1969 to 1986. 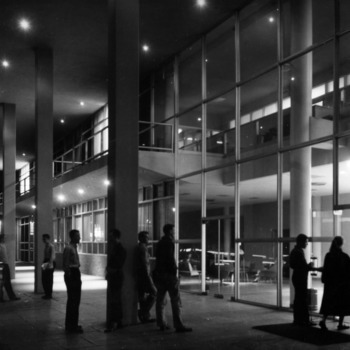 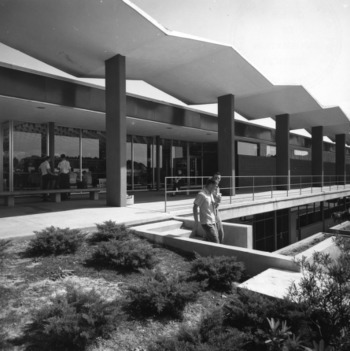 Fountain Dining Hall was built in 1982 and named for Dr. Alvin Marcus Fountain, professor of English for 46 years. 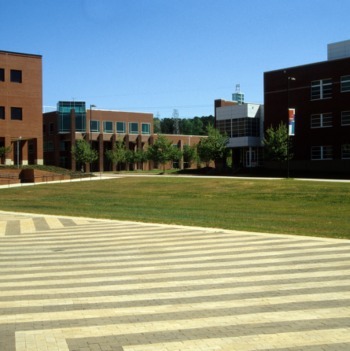 The Liquid Order Plaza, adjacent to the Monteith Research Center on Centennial Campus, was designed by artist Jun Kaneko. 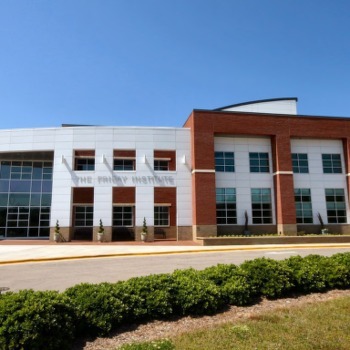 The Student Health Center building houses medical clinics, health education, mental health services and disability services. 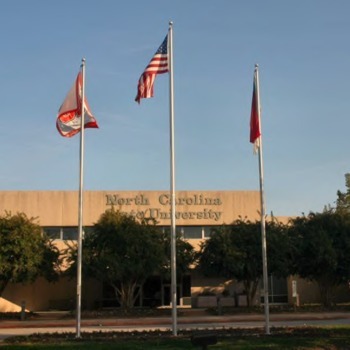 North Carolina voters approved the Higher Education Facilities Financing Act. 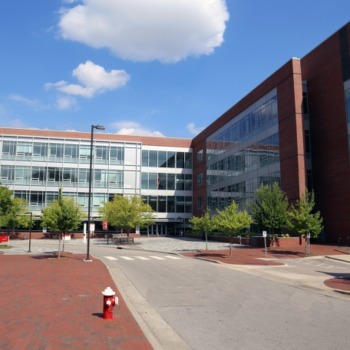 NC State's portion of the bond package (more than $468 million) resulted in four dozen construction projects on campus, including new classrooms and laboratories, as well as major renovations of many older buildings. 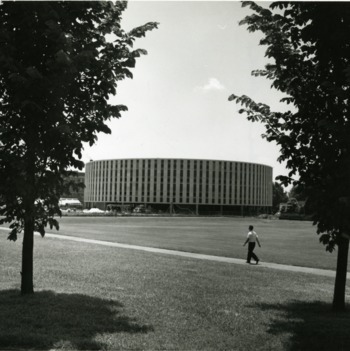 Originally known as the Flex Building, the Varsity Research Building served as swing space during a ten year construction campaign. 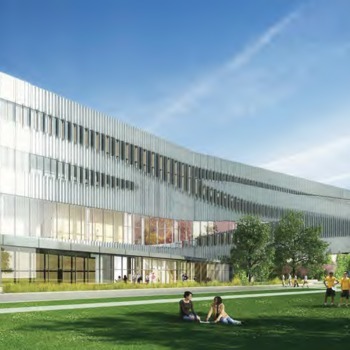 It now houses various research units. 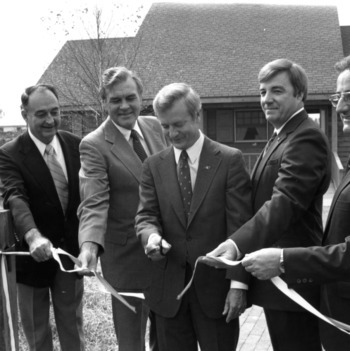 The Joyner Visitor Center was named for E. Carroll Joyner, an alumnus and honorary degree recipient. 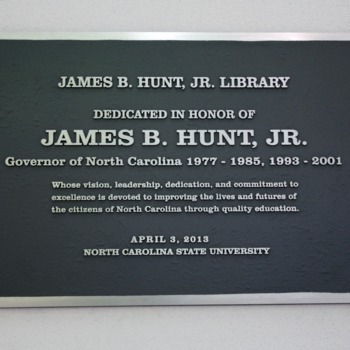 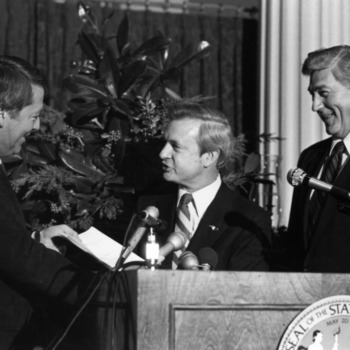 He also received the Watauga medal and was director of the NC State Foundation. 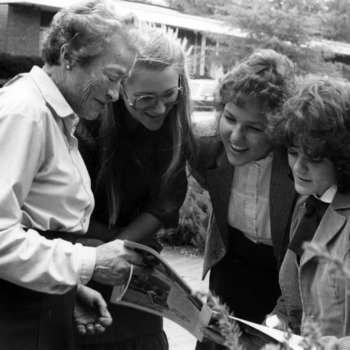 The center was founded for prospective students and their families, as well as other visitors. 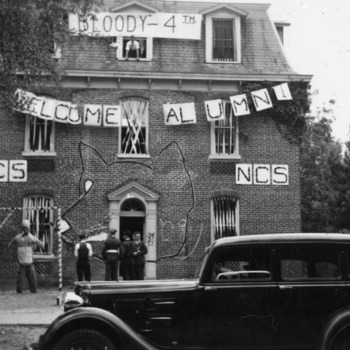 The Block S on the Brickyard was changed to include the "N" and "C." Previously it has just had the letter "S," which caused Chancellor Oblinger to say "it looks like this is Stanford." 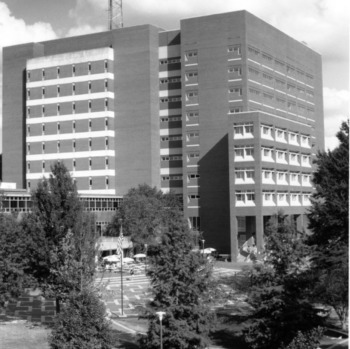 Anchored by the College of Veterinary Medicine, the CBC is located on the corner of Hillsborough Street and Blue Ridge Road. 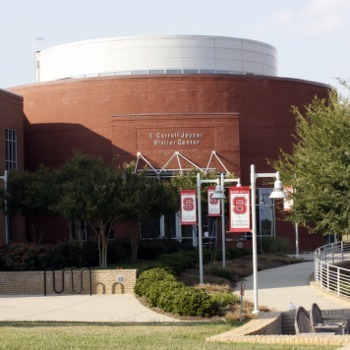 It is home to the Randall B. Terry, Jr. Companion Animal Veterinary Medical Center, more than 60 corporate and government partners, and 73 academic units. 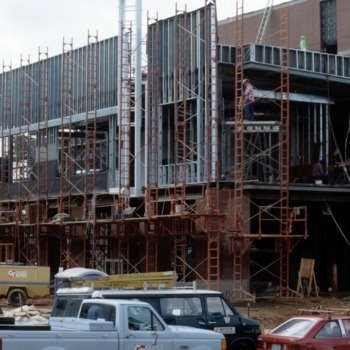 The addition significantly increased the amount of office and classroom space for the College of Natural Resources. 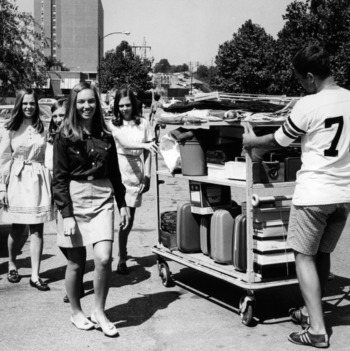 College of Design Dean Marvin Malecha leads the design effort. 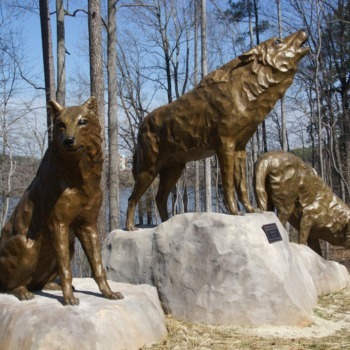 The trio of bronze wolf sculptures were created by artist Michael Stutz. 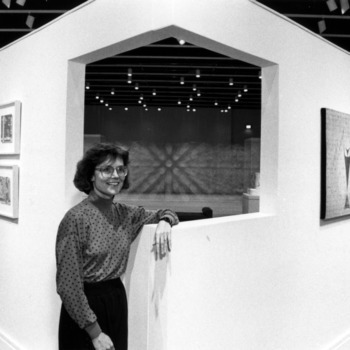 The Gregg Museum of Art & Design temporarily moves off-campus to Brickhaven, near the Raulston Arboretum, while the Old Chancellor's Residence space is prepared for it. 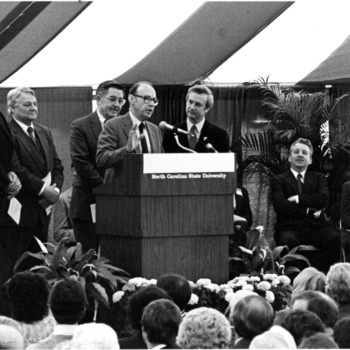 The museum reopened in the former chancellor's residence, which included a significant addition to the building.